Molecular mechanism underlying non-coding RNA mediated regulation of vascular and cardiovascular development in zebrafish. Development of the vascular and cardiovascular system is a tightly regulated multistage process and zebrafish has been established as an excellent model for studying human vascular and cardiovascular biology. Importantly, the genetic programs that regulate the development of these important processes are conserved through evolution. Multiple protein coding genes and several non-protein coding genes have been known to be involved in the development and maintenance of the vascular and cardiovascular system. 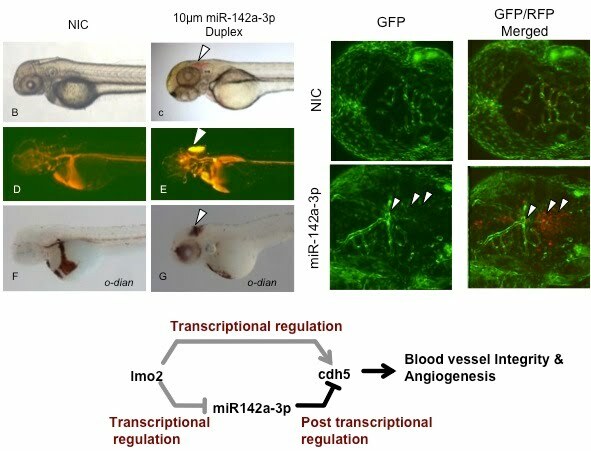 Work in our lab has established the biological role of several microRNAs in the development and maintenance of vascular integrity in zebrafish (Lalwani et al., 2012). The recently discovered novel class of long non-coding RNAs (lncRNAs) is also hypothesized to play crucial roles in regulating gene expression and thereby influence development of key biological processes (Bhartiya et al., 2012, Haque et al., 2014). 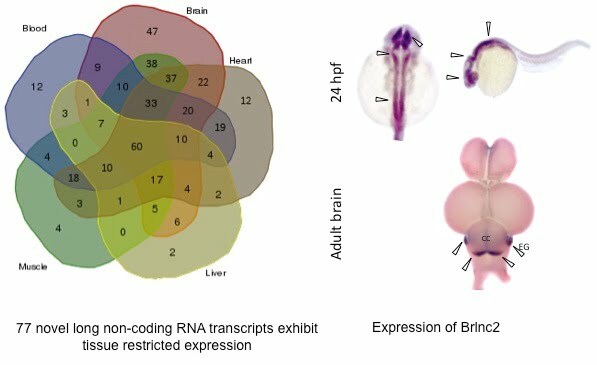 We explored the dynamic expression landscape of lncRNAs in adult zebrafish and identified over 400 novel lncRNAs. LncRNAs with specific expression in the cardiovascular tissues of zebrafish were also identified (Kaushik et al., 2013, Ramcharan et al 2016). Further we investigated the biological function and mechanism of selected lncRNAs involved in the development and maintenance of vascular and cardiovascular system employing diverse tools such as Locked Nucleic Acid enzyme (LNAzyme), Morpholino, TALEN and CRISPR/CAS9 based strategies for in vivo knockdown/knockout of selected lncRNAs in zebrafish embryos to understand their biological function (Suryawanshi et al 2012; Jalali et al 2013). We have also explored the transcriptome wide RNA secondary structure map of zebrafish (Kaushik et al 2018). Using a conditional in vivo protein-trap mutagenesis system that reveals spatiotemporal protein expression dynamics we assess gene function in zebrafish (Clark et al., 2011). A sub set of the zebrafish in this forward genetics screen display specific cardiovascular and vascular phenotypes. These putative mutant zebrafish are templates for understanding new vascular and cardiovascular biology. Genome sequencing has been increasingly adapted for diagnosis of genetic diseases. It is also anticipated that genome-guided therapeutic decisions would find its place in optimizing therapeutic interventions and minimizing adverse events. One of the major applications of such genomic technologies in the clinical settings could focus on the identification and annotation of variants associated with Rare Genetic Diseases, which affects a significant number of individuals / families in a populous country such as India. We initiated the Genomics for Understanding Rare Diseases: India Alliance Network (GUaRDIAN), a large-scale collaborative network of clinicians from around India trying to integrate genomics in clinical practice, with a singular focus to elucidate the genetic structure of Rare Genetic Diseases in India. We started by sequencing the first personal human genome from India (Patowary et al., 2012), Malaysia and Sri Lanka (Sallleh et al., 2013). Currently the lab runs one of the largest rare genetic disease genomics initiatives in India. We undertake both Whole exome and Whole genome sequencing of patients suffering from rare genetic diseases. The molecular variants identified from the genome sequencing activities are subjected to experimental validation in well-established vertebrate model organism such as zebrafish. Zebrafish models of rare genetic diseases open avenues for dissecting molecular mechanism underlying the rare genetic diseases.